That is the view of assistant manager Tony Docherty, who has pinpointed Considine’s dependability at a time when the Dons other centre-halves have all had spells out injured. 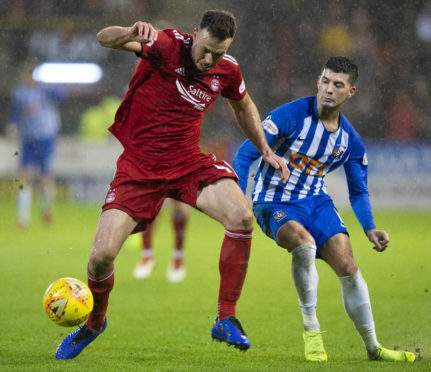 Considine started the season at left-back but has spent the majority of the campaign in the middle of the defence, after Mark Reynolds (knee), Tommie Hoban (shoulder), Mikey Devlin (foot) and Scott McKenna (hamstring) all had time on the sidelines. The 31-year-old, who made his debut for Aberdeen in 2004, is out of contract in the summer and as yet, no progress has been made on a new deal. Docherty said: “He’s been fantastic. Anything you ask him to do he does with a real consistency. He was fantastic at left-back and has played both sides at centre-half; there’s a real consistency there and he’s just a good professional. He’s a reliable performer you can hang your hat on. The last two games we’ve had clean sheets and he’s been integral to that. McKenna is unlikely to feature in tonight’s Scottish Cup fourth round replay at Stenhousemuir, after undergoing a scan yesterday on the hamstring injury that come off with 12 minutes to go against Kilmarnock on Saturday. Hoban, who replaced McKenna in the goal-less draw, is in contention. Docherty added: “We’re awaiting the full extent of it but fingers crossed it won’t be the severity of last time. Scott’s reaction certainly indicates that. “Tommie Hoban did a great job when he came on and he’ll come into contention. Mark Reynolds is another one to come in. Although you don’t want players to go out, you build a squad to cope with these sorts of things. No stone has been left unturned for the Dons in preparation for their replay tonight, after Mark McGuigan’s goal earned at Pittodrie them a second crack at the Premiership side. They have had a tumultuous season so far, sitting bottom of League 1 and sacking manager Brown Ferguson in November, replacing him with Colin McMenamin. Docherty said: “We’re still in the cup. We’ve still got an opportunity to progress and we treat Stenny with the utmost respect. When they came here, we never underestimated them in any way. We treat every opponent the same way. We came up against a very organised team that was clinical, when they got their chance in front of goal.